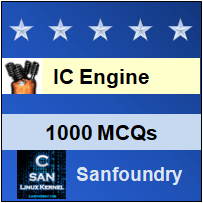 This set of IC Engines Multiple Choice Questions & Answers (MCQs) focuses on “Group Gasoline Injection System – 1”. Explanation: In an engine having group gasoline injection system, the injectors are not activated individually, but activated in groups. 2. For a group injection system, sensors are used for detecting _____________ in the manifold. Explanation: For a group injection system, sensors are used for detecting pressure in the manifold and not speed and coolant. 3. The timing of the injectors is decided by the engine speed sensor. Explanation: Yes, the timing of the injectors is decided by the engine speed sensor. 4. In pilot ignition system, large quantity of fuel is injected. Explanation: No, but in pilot ignition system, a small quantity of fuel is first injected and allowed to undergo the ignition delay and burn. 5. By using EFI systems, precise control of injection timing can be achieved. Explanation: Yes, by using EFI systems, precise control of injection timing can be achieved. v) pilot injection timing and its quantity. iii) common rail fuel injection system.